Despite the high hopes for EU-wide financial stability invested in the European Economic and Monetary Union, it is becoming more and more evident that the limited supervisory role of the European Central Bank has added to an already overcomplicated situation. Although European regulatory competences are now increasingly formalised through detailed rule-making, they remain broad and widely discretionary. It is still the many different national authorities that are regulating or supervising banks and other financial institutions. The root issue¿what is the relationship between an effective European supervisor and the supervisory functions that remain at the Member State level?¿has not yet been adequately addressed. 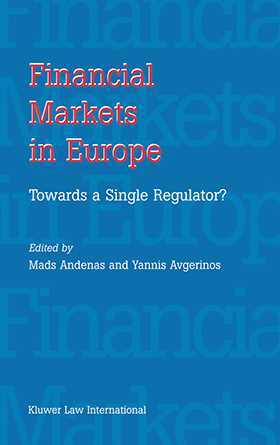 The essays in this important book ask the question: Given that there is no viable political structure to support an international regulator of financial markets, what can lead to regulatory change in Europe? The authors demonstrate convincingly that if this question is not answered soon¿and especially if the reality of the need for regulation to avert international financial crises is not faced squarely¿then we will continue to experience panic-stricken short-term responses to repeated crises. the apparent inertia of major business players, in spite of the obvious benefits for them of EU level regulation. Financial Markets in Europe offers a large and welcome measure of clear thinking to the entire professional community¿regulators, bankers, scholars, insurance professionals, securities managers¿engaged in the complex field of activity guided by monetary policy and supervision of financial markets. Because it raises broad issues and perspectives for a globalised world, it will be of value not only in Europe but to financial services specialists everywhere.